One week ago I arrived in Thailand, full of eager anticipation to taste one of my favorite world cuisines in the mother land, just as it is meant to be. I don’t remember the first time I ate pad thai in my life, but it has long since become a near addiction for me. Tangy, sweet, spicy, nutty deliciousness has ensured that I almost never order anything else when eating Thai. After resolving in 2012 to post once a week and already lagging behind in my goal, it didn’t take long to settle on a topic: the incredible Thai food in which I’ve been voraciously indulging for the past seven days. That and a couple of cute animal pics for good measure, because everybody loves those. In Chiang Mai, a small but bustling city in the north of Thailand, nestled at the foot of rainforest-laden mountains, we were lucky enough to learn about a tiny vegetarian restaurant, Aum, located a block from our hotel. 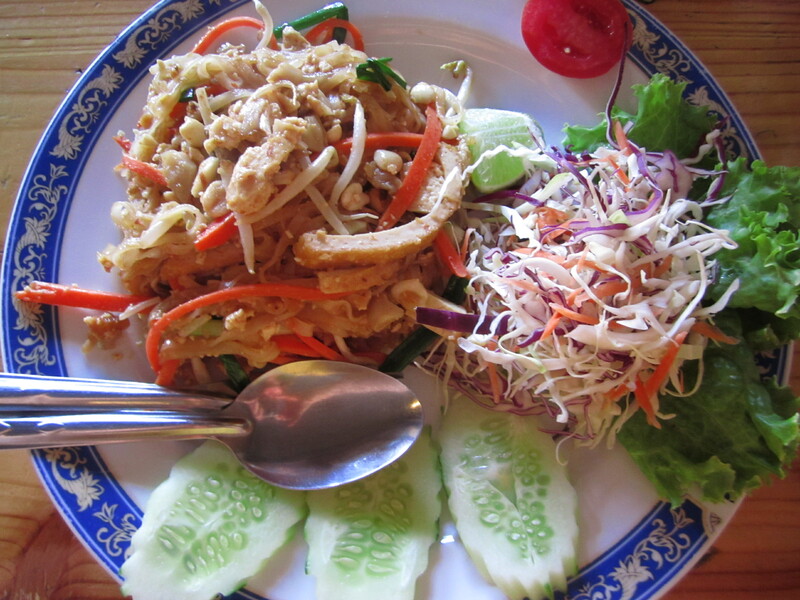 It was mid afternoon, we hadn’t eaten since breakfast, and my pad thai craving was almost unbearable. Highlights from the giant meal include two smoothies (the mango one is pictured above), a whole fresh coconut, pad thai, and some noodle soup thing whose name I don’t remember (pictured below). I was immediately charmed by the unassuming yet elegant presentation of the food and drinks. 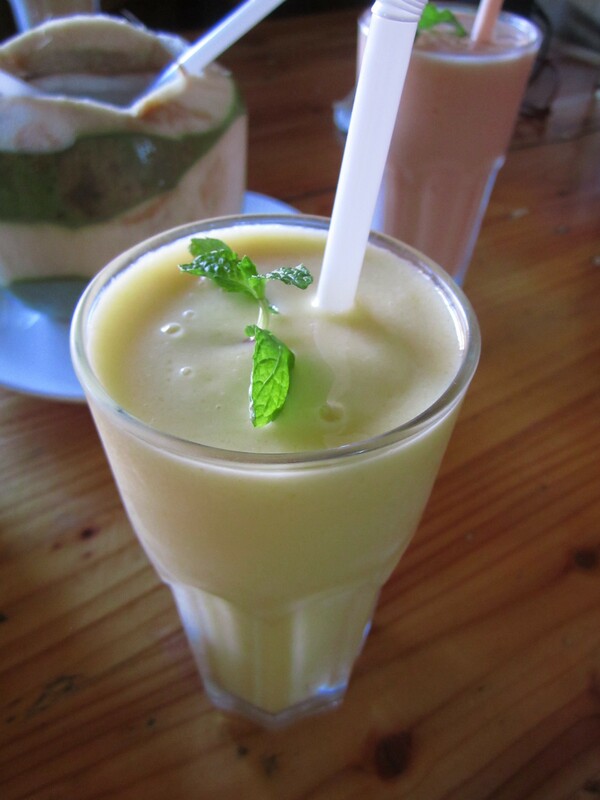 I have come to the conclusion that all smoothies should be so lucky to boast a fresh mint sprig for a garnish. And of the pad thai, which totally and utterly hit the spot, I was surprised to discover that it did not taste drastically different from the kind I’m used to eating in California. This surprised me, as so many “traditional dishes” understandably evolve and morph as a result of distance, tastes, and ingredient availability. 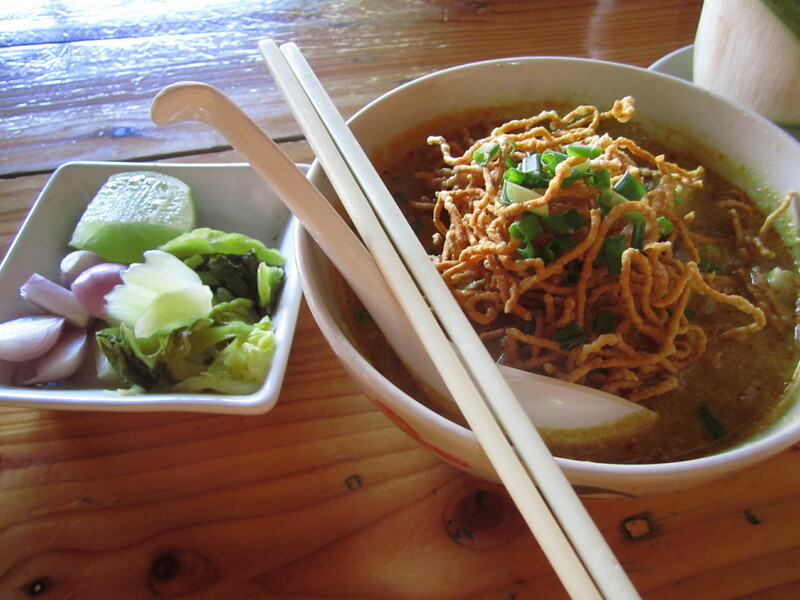 It comforts me to know that I will be able to return to San Francisco and continue happily eating Thai food. Other foods have not treated me so well outside their home country. Croissants, for instance, I rarely eat except in France, even though that makes for the sad reality of barely ever eating croissants (I’ve been burned too many times). 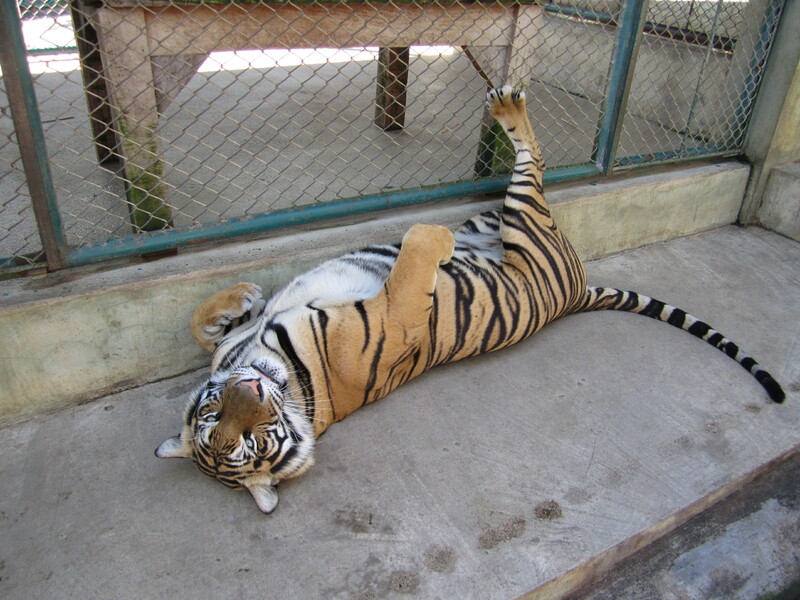 And now for something completely different… In Thailand you can hang out with tigers. By hang out I mean you can pet, cuddle, lay upon, squeeze, and get up close and personal. Just try not to think about the claws or the teeth. At the Tiger Kingdom, visitors are assured that no sedatives or cruel treatment are utilized to turn these gargantuan felines into relatively docile playmates. I did feel a slight moral quandary in paying money to pet a tiger in a cage – no matter how nice the cage and no matter how content said tiger appeared to be. It was nonetheless an exhilarating experience. And at the end of the day, a cat is a cat. In all their sassy, lazy, attention-loving glory. And who doesn’t feel happy after seeing an elephant? Especially one as strangely hairy and cartoon-like as this spry young fellow. As I snapped this photo, he was on his way down to the river to take his bath with all his other elephant friends. 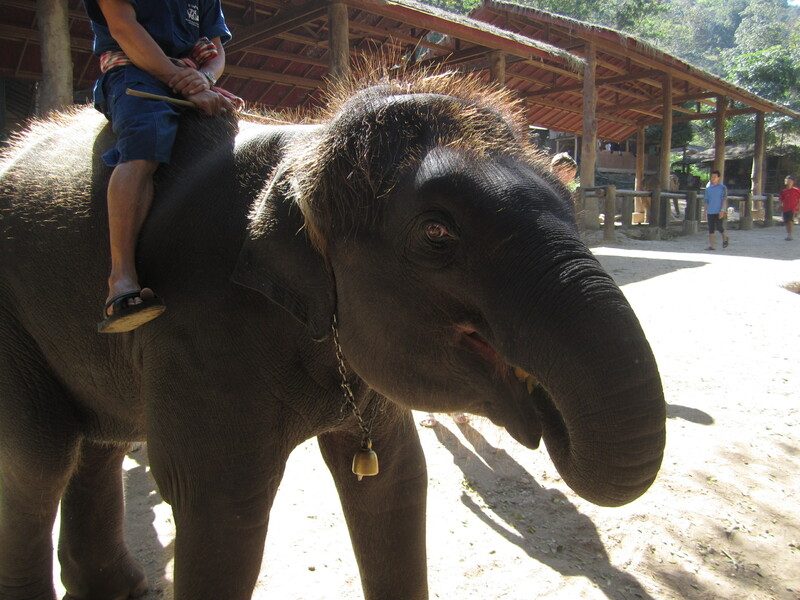 His trunk is in his mouth because he just grubbed on some bananas and sugar cane offered up by squealing tourists. Yet another reason to love elephants – they’ve all got a serious sweet tooth! This entry was posted in Not pie and tagged elephant, mango, pad thai, thailand, tiger, travels. Bookmark the permalink.